Earlier today, I wrote a bit about the Apple September Event and it’s affect or appeal to genealogists on the go. With the iPod touches once again mirroring the current iPhones for the most part, and becoming incredibly powerful and rounding things out with the iPad, I mentioned that I think genealogy apps on the iOS platform will continue to increase. 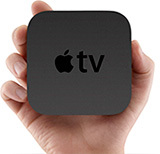 I also mentioned the use of the new Apple TV for doing presentations or acting as a backdrop of sorts at family reunions, for streaming video or slideshows to an HDTV. A few hours ago, a friend asked why I didn’t just hook up my laptop to an HDTV and do the same thing and save $99. There are two answers to that. One reason: At a large gathering with a lot of people, especially where there will probably be a lot of kids, I really don’t feel like leaving my laptop out in the open and hooked up to a TV. Too much potential for something to happen to it, whether it’s getting knocked to the floor, or somebody deciding they want to try and play games on it or do who knows what else. I don’t want to spend my time babysitting my laptop. Having it off elsewhere, where it can be secured, frees me up from wasting my time. It can also be used with a desktop PC, which means not having a tower sitting there hooked up to the TV. The second reason: At a presentation, if I’m presenting photos or video, I really don’t want to have my laptop tethered directly to the TV, because it will be a distraction as people will be paying attention to me and not the TV. There would be times where I’d want to be out front of course, but a lot of times, if I’m going through something, I want the focus to be on what’s being displayed, and not me. I might lose the advantage of not being able to do a live demonstration of software, but I can still easily hook up my laptop for that if needed. I can also do screenshots of software or content and have those displayed through the Apple TV device as well. It would be really nice if I could tell the Apple TV device to switch from displaying photos or streaming a video to streaming my desktop, and maybe that’s a future update, but I’m not counting on it. Of course, a genealogist using an Apple TV device is still reliant upon having a decent-sized HDTV available. If that’s not the case, you’ll still have to pull out the trusty old projector.